UNIVERSITY PARK — It’s not wise to emerge from the Blue-White Game armed with sweeping conclusions. 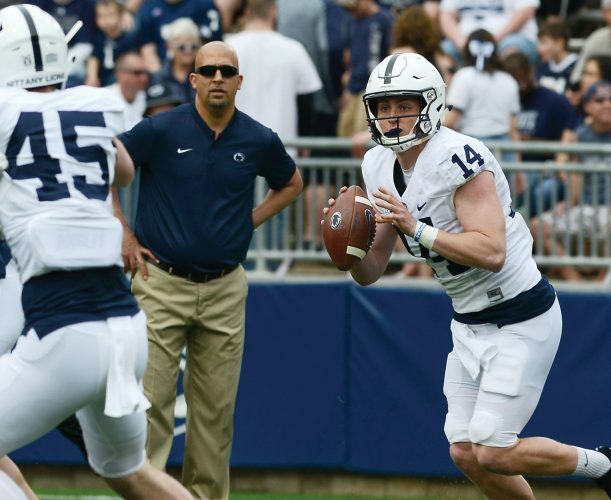 The game is less than a glorified scrimmage because the playbook is “vanilla,” according to James Franklin, who also stacks the roster heavily in favor of the Blue team. The first team and second teams typically comprise the Blue while the White is made up of walk-ons and freshmen. The Blue managed 56 yards rushing on 18 carries (3.1 average) with the longest run an 11-yarder by quarterback Sean Clifford In a game where the QBs can’t be tackled. He did praise the work of true freshman running back Noah Cain, who averaged 5.1 yards per carry against the Blue defense, then switched jerseys and got more work with the Blue. Franklin called Cain “decisive,” and while it’s likely Ricky Slade will be the starter, Cain’s efforts will create some competition along with Journey Brown. But the quality of Penn State’s running backs haven’t been at issue in the last couple of years. Any team would take Saquon Barkley and Miles Sanders. It’s no secret that the Lions’ offensive line has been less than imposing, particularly when games hang in the balance and a couple first downs are the difference between winning and losing. That seemed to be the message Franklin was sending Saturday, and it’s understandable. In breaking in a first-year starting quarterback, whether it’s Tommy Stevens or Clifford, along with a skill-position group made up of almost all sophomores, it sure will take some pressure off everybody if the offensive line can stand up and be counted. “I think we’re going to be really physical up front,” tight end Pat Freiermuth said. Maybe he means like Kentucky was with the Citrus Bowl on the line. Off an average line, the Lions lost Connor McGovern and Ryan Bates to early NFL departures. And they almost lost three-year Steven Gonzalez, who decided at the last minute to stay. Gonzalez’s return should bolster a line that returns fellow starters Michal Menet (center), tackle Will Fries and likely starter C.J. Thorpe, who is back from a temporary move to defense. Offensive coordinator Ricky Rahne was also disappointed in Saturday’s ground game, but he said he was pleased with the overall spring progress. He, too, is stressing mindset. Fries agrees and welcomes the challenge. 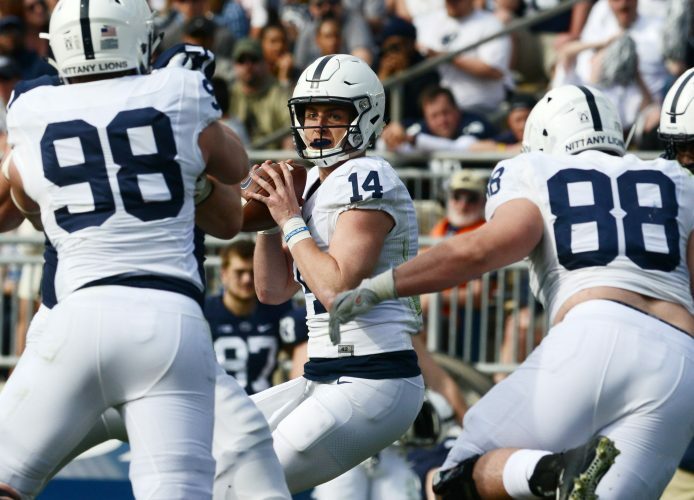 Trace McSorley handled so many leadership responsibilities in the past that must now be distributed – especially with a road schedule that includes trips to Ohio State, Michigan State and Iowa.